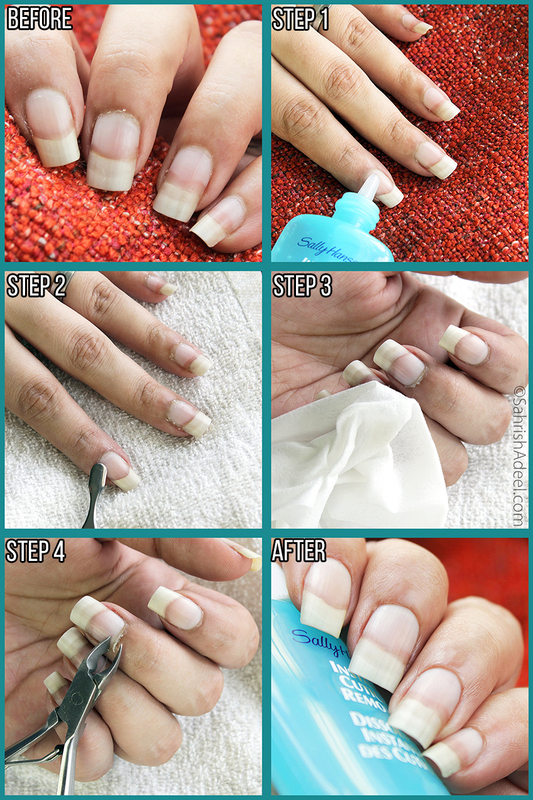 Instant Cuticle Remover by Sally Hansen - Review & Step by Step Guide | Sahrish Adeel - Malaysia based Pakistani Beauty & Lifestyle Blogger! Being able to remove cuticles in 15 seconds instead of dipping the fingers in water for 15 minutes, sounded awesome to me so I bought Sally Hansen's Instant Cuticle Remover, immediately. But did it actually work? Let's find out! 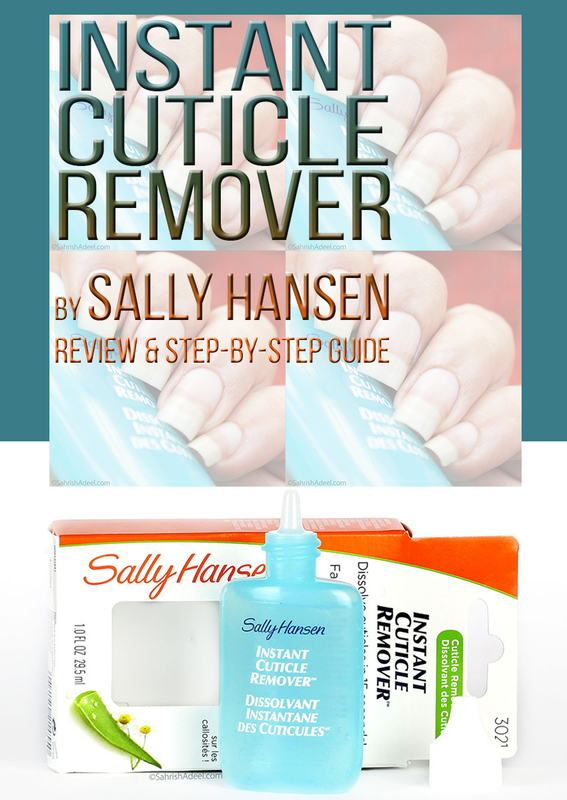 Instant Cuticle Remover by Sally Hansen comes in a cardboard packaging that has all the details, including but not limited to; directions, about the product etc. The product itself is in the form of a gel and it comes in a squeezable plastic bottle. The bottle has 29.5 ml of product. Results - Keep reading to know how to get these! If you are like me and you do your manicures at home, you may have faced the time when you just do not want to dip your nails and fingers in water for so long just to make your cuticles soft enough to push. Or maybe, you just do not have that kind of time and hence, you just go without a manicure for weeks or even months. I have to treat my cuticles every week and sometimes even earlier if I always want my nails to look their best but I hate when I keep my nails in water for long and to be honest, all these years, I could never find a cuticle softener/remover that actually worked until I tried Sally Hansen's Instant Cuticle Remover. I must say that I wasn't even 1% certain that it will work but I saw one online, bought it just by reading the description and without reading any reviews at all. Why? because I wanted to try it all by myself and I am glad that I did so my own experience is now based on a truly first impression and then multiple usages. Let's begin. The gel consistency is easy to work with. It comes out of the bottle easily when you squeeze it but is not runny so you don't accidentally waste any product. It also smells nice. After application, my softer cuticles took about 10-15 seconds to become really soft and harder took a little over 30 seconds. The cuticles almost became like a white-ish paste and I was able to scrap them off with a cuticle pusher and the remaining I was able to cut with a cuticle cutter. I am in love with this magic product. I did not have any reactions, sensitivity or any change in my cuticles plus the formula does not sting if I have any damaged skin. Overall, I could not be happier and I am repurchasing the product once I run out which would take a long time because 29.5 ml is a lot of product. Step 1: Apply a thin amount of gel all around the cuticle and wait for 15 to 30 seconds, depending on the hardness of the cuticle. Step 2: Use your preferred cuticle pusher and push away the softened cuticle. Most of it should be in a paste form but some will be pushed that you can cut later. Step 3: Either wipe away all the product with a wet wipe or rinse with soapy water. Step 4: Cut off any lose cuticle/skin with a cuticle clipper and you are done. Keep the cap closed on the bottle during use because the formula dries fast. Wash off any product after you are done because it is advised by the brand. Apply the gel on one or maximum two nails at a time because it dries fast and you will have to reapply, resulting in wastage of product. Do not leave the product on your skin for over a minute. If a cuticle is still hard to push after 15 seconds, leave the product on for a few more seconds. 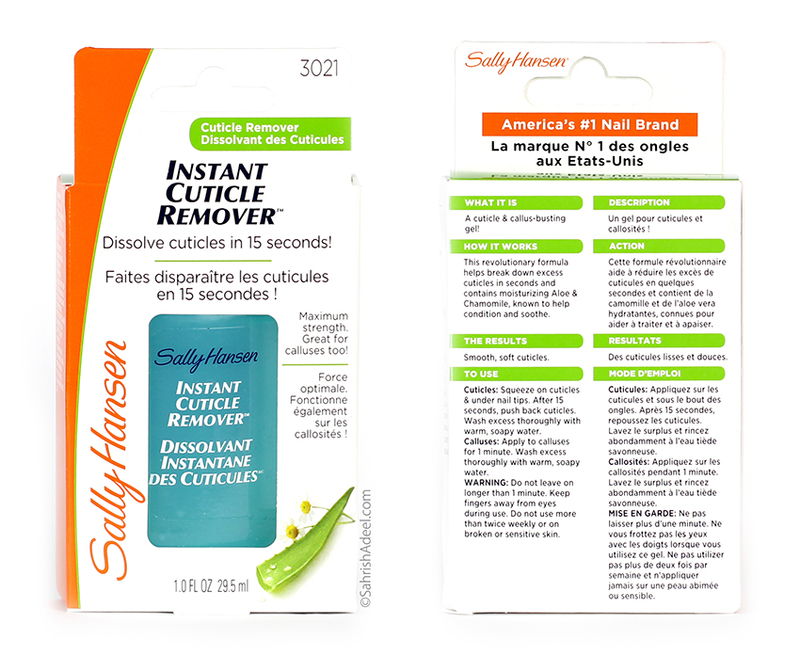 Instant Cuticle Remover by Sally Hansen comes with a price tag of US$4.97 to US$7.49 depending on where you buy it online from. I am including all the links below with prices. Sally Hansen products are also available in many drugstores all over the world.